Oticon was founded in 1904, and its headquarters are based in Denmark. Oticon is the second largest hearing aid manufacturer in the world. 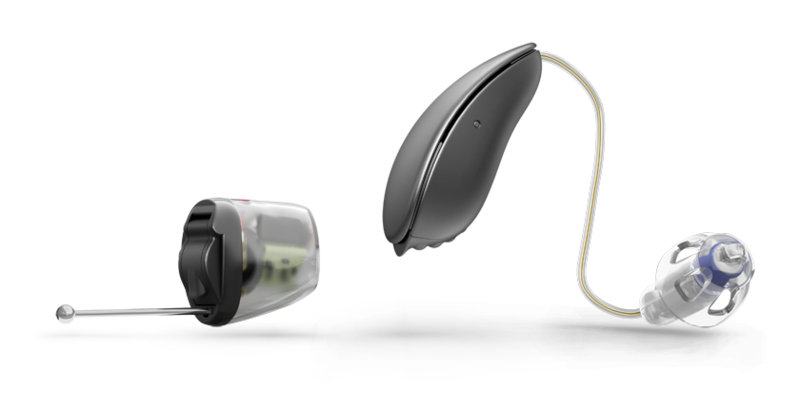 Oticon has just released their groundbreaking, premium level technology hearing aid called Opn. Built upon the brand new Velux™ platform, this processor allows the Opn hearing aids to scan the environment 100 times per second allowing you to follow rapidly changing conversations, even in background noise, with less effort. The Oticon Opn is also Oticon’s first ‘Made for iPhone’ hearing aid, meaning it can communicate directly to your mobile phone for seamless phone conversations, listening to music or watching videos. What’s more, with the Oticon ON App, you can control the volume of your hearing aids, change programs, check the battery level on your hearing aids. there is even a ‘find my hearing aid’ feature in the event you misplace the hearing aids. Released in March 2015, the Inium Sense Platform hearing aids are made up of 3 families: Alta2, Nera2 and Ria2. Alta2 is Oticon’s premium level of technology. Alta2 will provide the clearest hearing with the least effort out of all the Oticon hearing aids, because it includes all four of Oticon’s BrainHearing technologies. Alta2 is available in the most discreet styles from the miniRITE BTE to the invisible IIC, therefore there is a style of Alta2 to meet your needs. Alta2 is perfectly matched to Oticon’s ConnectLine accessories to significantly improve your listening experience. See below for more information on ConnectLine. A full list of the Alta2 features and a comparison to other families can be found via the link to the left. Ria2 includes two of Oticon’s BrainHearing features – FreeFocus and YouMatic -to give a good listening experience which offers excellent hearing clarity and comfort for those who lead a quieter life. Ria2 features technology which synchronises the performance of the two hearing aids, which gives you a balanced listening experience to create better speech understanding. Ria2 is compatible with ConnectLine, and is available in a wide range of styles and colours to match your individual preference. ConnectLine perfectly complements your Oticon hearing instruments by allowing you to wirelessly stream phone calls, TV, music and many other devices directly to your hearing aids. The key component of ConnectLine is the Streamer Pro, a convenient, lightweight device looks similar to an MP3 player, the Streamer is worn around the neck, and features 3 dedicated buttons for the core applications: phone, TV and microphone. The new ConnectLine App for iPhone® takes your experience to the next level. Using the ConnectLine App for iPhone you can set the sound levels for your phone, TV, music and any other devices you are connected with.